Can you Imagine Making $1 Every Second? It’s hard to imagine making $1 a second. On the surface, it’s not immediately evident that it is the equivalence of $86,400 per day or $31.5 Million a year. While most people and even companies would consider that a windfall, the most profitable companies would probably consider it a devasting year. That may sound harsh until you know that the most profitable company made $1,444 in profit per second, equivalent to $5.2 million per hour, $127 million per day, or $45.7 billion per year, based on 2016 net figures. Find out what the top 25 companies made the “least profitable” company making $274.96 per second or 8.7 billion dollars per year! 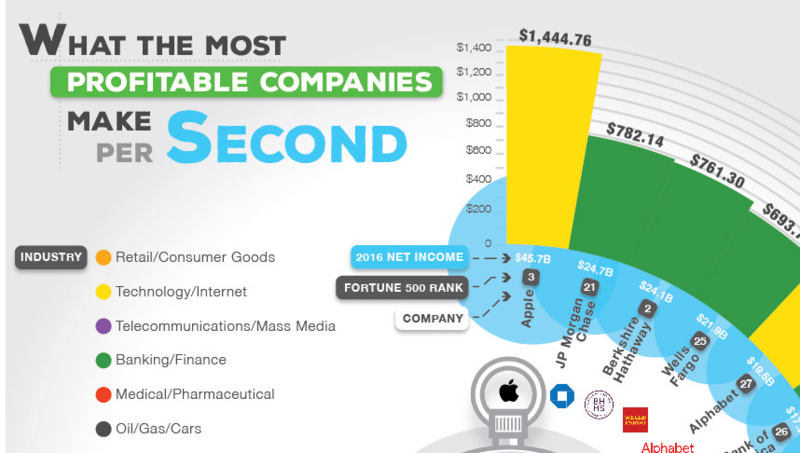 See the full list of 25 top profitable companies [infographic] and what they make per second!